Fall is here(ish) and I am stoked! 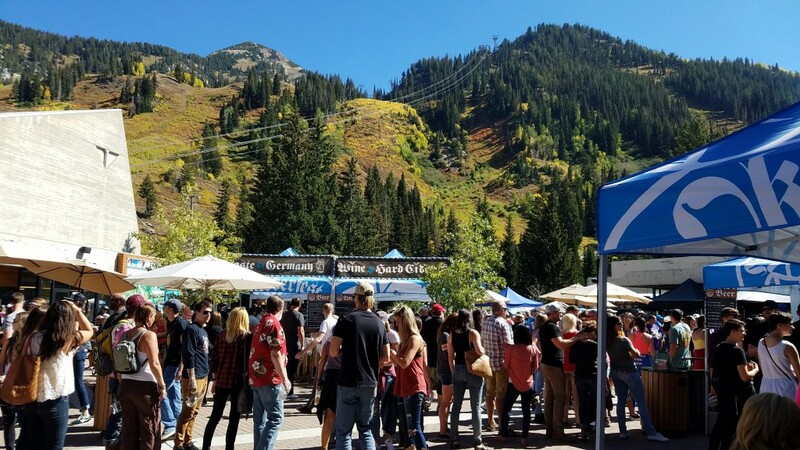 This weekend, I went to the Oktoberfest event at Snowbird Ski and Summer Resort for the first time. I’ve been in Salt Lake for almost three years but I’ve never been to this event, despite hearing lots of good things from locals and friends. How Much? Entrance is free, but parking is $5/car (this year) so carpool! 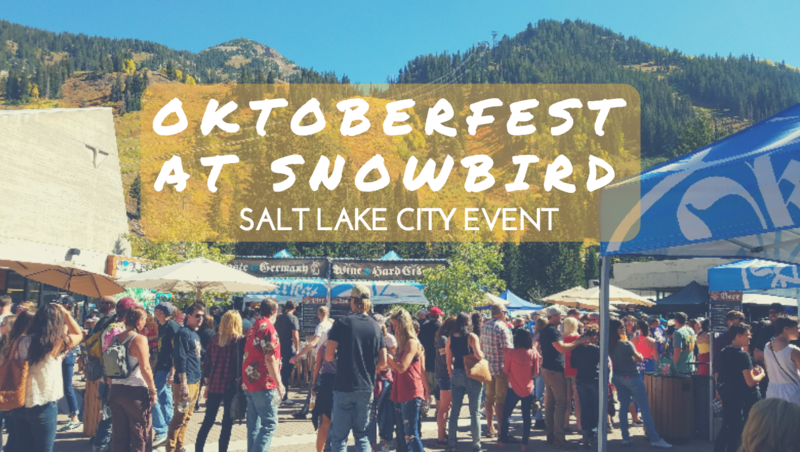 For more info, check out Snowbird’s website! Brighton and I went with our friends Rachel and Brandon (who you might remember from our Moab trip in February). I felt like it was the right size group for this type of event because even with us getting there early, it was still super crowded and with a large group it would be cumbersome to try to keep everyone together. On our initial trip through the line, we bought the mug & a drink at once. When you went back through the lines, they gave you a slip of paper to show that you had already purchased the mug at checkout. 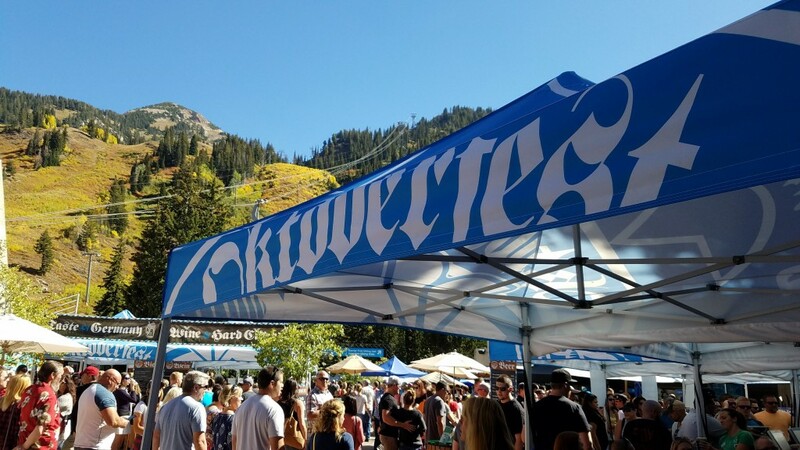 Now, I will shamefully raise my hand in not liking beer… So I wasn’t sure what this festival would have for a non-beer drinker like me. 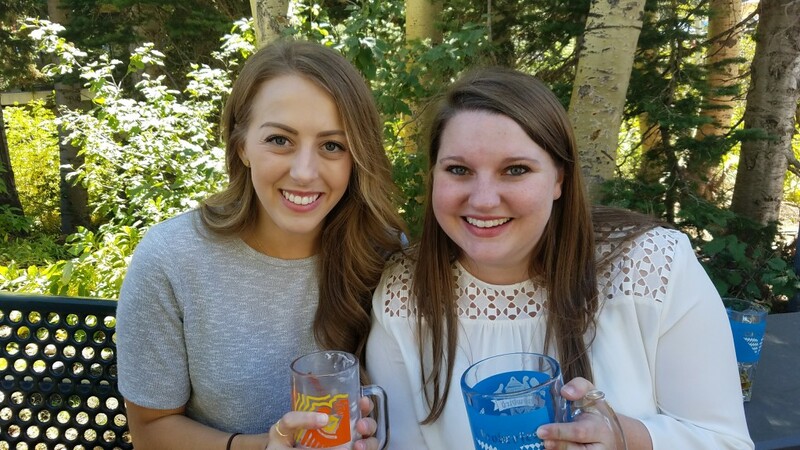 First, they did have Angry Orchard Hard Cider on draft (but it was only a 5 oz pour… thanks Utah) or a 12 oz can of Smith & Forge cider, which I’d never had before! So I was able to get something I enjoyed while the others got all the different types of beer. I believe they also had a liquor tent or bar somewhere, but we never found it. After we got our beverages, we found the waffle stand. 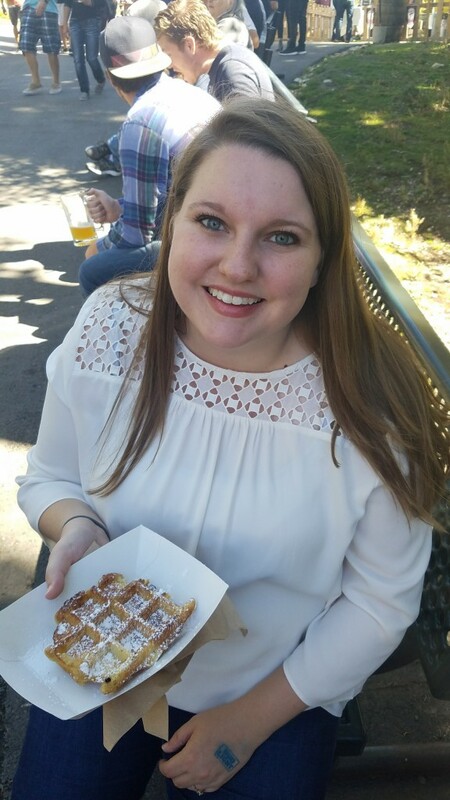 I am a sucker for Belgium waffles now. I used to hate waffles, but now I am a waffle fiend— Especially of the dessert/sweet variety. They had waffles dipped in frosting (I think) on a stick. WHAT! 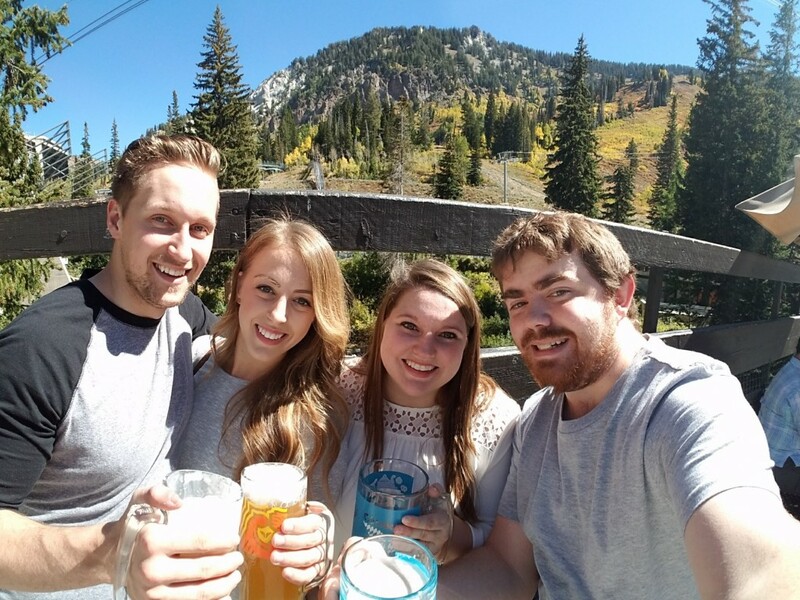 We all got waffles and hung out enjoying the views. I love seeing the changing leaves in the canyons as we drove up Little Cottonwood Canyon. We considered going up the tram or on their few different activities (alpine slide, coaster, etc), but we decided we didn’t want to spend the money to do those things. 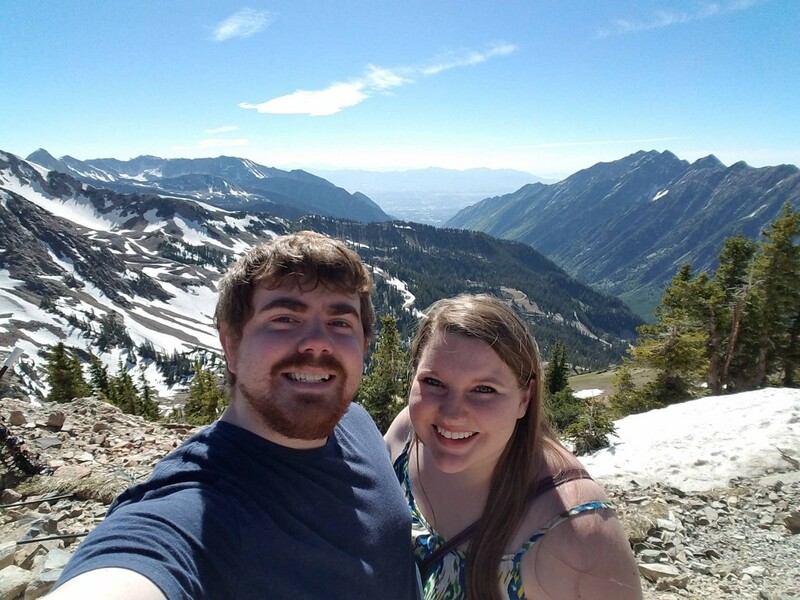 When Brighton and I had visited during Brewfest, someone gave us free tram tickets to the top of Hidden Peak which was pretty cool (photo below). After a while we found ourselves in the large, white food tent. They had a relatively efficient system to handle the very long line. You waited in line, and as you got closer they had people with iPad terminals that you ordered with and they gave you a ticket. When you got to the food area, they had people getting all the tickets with the names and they’d plate the food and you’d pay right after. The line, while it was very long, only took us 10 minutes or so. The food was “authentic” German foods, like schnitzel and goulash. Both of us got the paprika chicken and split it. The plate was HUGE! The entree came with a large cut of chicken, potato salad, a pickle, and sauerkraut. While we ate, there was live music playing on the stage and we even saw the German-equivalent to a conga line pass through the crowd. We wandered around, took photos with their photo booths, and I bought a long sleeve comfy shirt. Hey, don’t judge, winter is coming! Get there early! We went as it was opening, and it was busy. By the time we left, the lines were pretty outrageous. 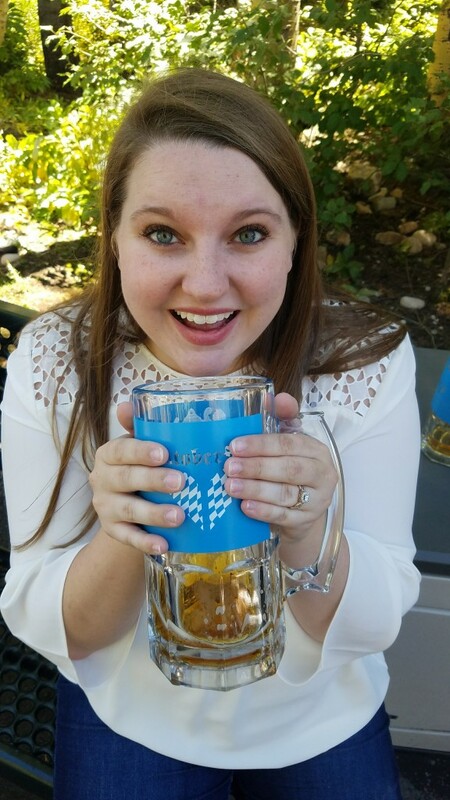 Bring your own Oktoberfest mug to save yourself some money! From what I saw, they didn’t have a problem with people bringing their own mug in. They also had disposable cups. Wear sunscreen or sun protection! You’re at a higher elevation in the mountains and can get burnt even easier than usual. Carpool to avoid paying double at the parking lot! Be prepared to spend money or not drink/eat much. 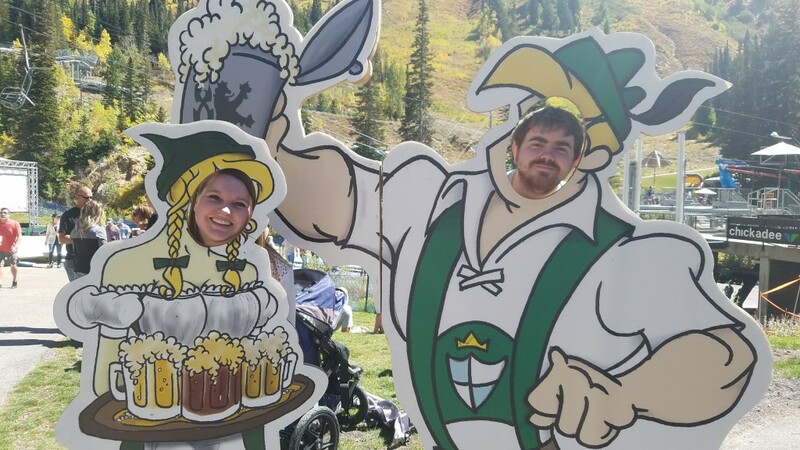 What is your favorite part of Oktoberfest? 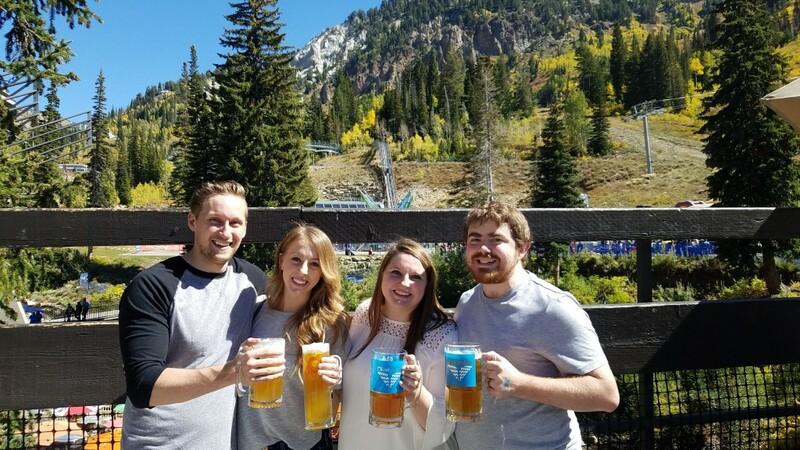 Have you been to an Oktoberfest in another location?